Pre-cut membranes (10 sheets, 7 x 9 cm), compatible with gels 10 x 10 cm and smaller. Note: PVDF membranes must be activated prior to use. Membrane activation protocol: 1. Pre-wet the membrane in methanol for a few moments until the membrane is completely wet. 2. Transfer the wet membrane from methanol to purified water and incubate on a rocker or shaker for at least 5 minutes. Make sure that the membrane is fully immersed in water and does not float on the water’s surface. 3. Transfer the membrane from water to transfer buffer, and incubate for 5 minutes. Our Abpromise guarantee covers the use of ab133411 in the following tested applications. Publishing research using ab133411? Please let us know so that we can cite the reference in this datasheet. We tried other popular PVDF membranes and just didn't get the sort of clarity we wanted until we started using the Optiblot reagent kits. The PVDF is recommended for use with the Optiblot kits and we have be able to obtain excellent transfer of protein from 17-well and 12-well Optiblot gels onto the membranes as well subsequent detection of a weakly expressed membrane protein. The image is taken straight after blotting for 2 and a half hour in the Optiblot reagents, followed by Ponceau S staining for 1 minute, with ladder in blue and 17-lanes of protein (70ug per lane). The developed images is for detection of Beta-Actin. The membrane itself is quite robust to stripping and not prone to tearing. 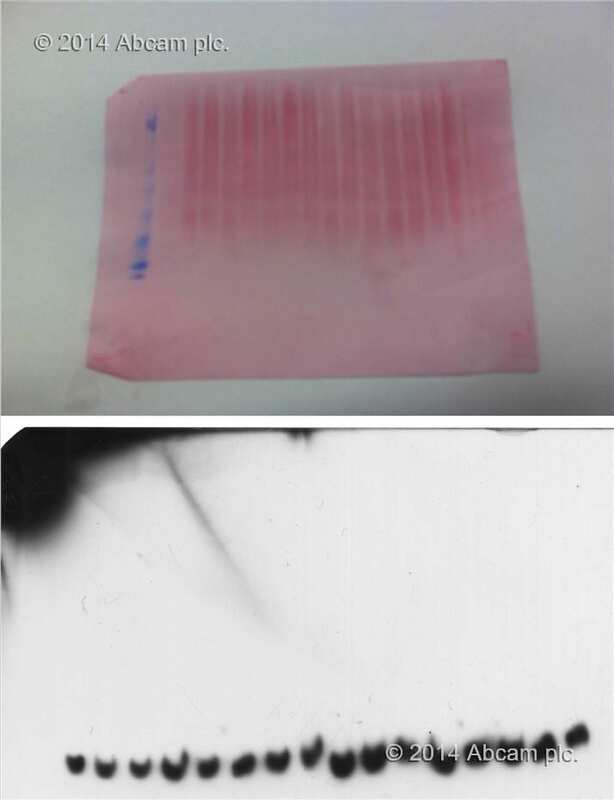 Overall, compared to other PVDF membranes, when combined with the Optblot reagents, we have seen a successful series of blots and detection of proteins. Thank you very much for your information. If I am transferring a small protein molecule around 3 kDa MW, what transfer condition would you recommend me to use in terms of voltage and time of transfer using this membrane? I just noticed that I had forgotten to add the Western Blot guide that I mentioned in the last email. I have attached the guide to this email. Generally when transferring a very small protein, it is best to use a semi-dry transfer procedure. These usually run at 100V for 40-60 minutes. I would recommend transfer times at the lower end to this range. It is also helpful to remove SDS from your transfer buffer when transferring small proteins. I have included with this email our Western blot guide which includes further transfer information. Below I have included a link to our WB reagents page which has a semi-dry transfer buffer recipe. Finally, I have a brief protocol for semi-dry transfer which I will place at the end of this email. 1. Cut 6-10 sheets of filter paper same size as the gel. 2. Cut membrane to the size of the gel. 3. Membrane activation for PVDF: soak in methanol for 15 seconds and then transfer to a containerfilled with distilled water for 5 minutes. 5. Soak filter paper in transfer buffer for several minutes to 10 minutes to avoid trapping of air bubble. 7. Use a roller to roll over the sandwich gently to remove trapped air bubbles. 8. Apply few ml transfer buffer on top of the sandwich to avoid drying out during membrane transformation. 9. Transfer at 100 V for 40-60 minutes. Customer kindly contacted us regarding the pore size of the PVDF membranes (ab133411) as well as for further information about other products.